As one circle rolls around fixed circle, how many revolutions will the rolling circle make? 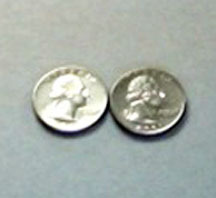 Take two coins such as pictured on the right. Hold the one on the left stationary and carefully roll the one on the right around it, taking care not to slip during the turn. Count the number of revolutions of the rolling coin by watching the orientation of the head on the coin. In the picture to the right, a red circle with radius 1 is rolled around the OUTSIDE of a green circle with radius 3. Click for a GSP Animation. Watching the arrow radius of the small circle, how many revolutions of the small circle will occur in one trip around the green circle? In the picture to the right, a red circle with radius 1 is rolled around the INSIDE of a green circle of radius 3. Click for a GSPAnimation. Watching the arrow radius of the small circle, how many revolutions of the small circle will occur in one trip around the green circle? In the picture to the right, a red circle of radius 2 is rolled around the OUTSIDE of a green circle of radius 3. Click for a GSPAnimation. Watching the arrow of the radius of the small circle, how many revolution of the small circle will occur in one trip around the green circle. Constrct a GSP sketch to explore other combinations of radii? Given a circle of radius r rolling around the OUTSIDE of a circle of radius R. Express the number of revolution of the small circle in one trip around the large circle..